It is great to be back. Sam and I are hoping to build off 1,530 views in a few short months in 2013 toward our goal of 10,000 views in 2014. As always, we will have our regular posts on Mondays and Fridays. Sam will post his 4th & 10 on Wednesdays. New for 2014, I will be posting my column Out of Bounds each Thursday. The SEC will put its streak on the line against the ACC’s Florida State Seminoles on Monday night. Auburn will look for it’s second national title in the past four years. FSU hasn’t played in the title game since 2000. Auburn boasts one of the great rushing attacks in recent memory. The explosive running style of Nick Marshall complimenting Tre Mason’s ability to grind out tough yardage makes Auburn particularly potent. The Tigers will rely on their running game and timely throws by Marshall to move the ball on the stingy defense of Florida State. Florida State defensively features remarkable talent across the board. The FSU secondary is the strength of the defense. This should allow for Florida State to be more creative and allow more players to stay at home in run support. Though it will be difficult to imagine any team stopping Auburn’s rushing attack, FSU will look to contain the big plays that have plagued Auburn’s opponents this season. Auburn’s greatest asset defensively continues to be depth on the defensive line. The Tigers will likely play as many as eight players in order to keep their best players relatively fresh for pivotal stretches late in the game. This strategy has paid dividends this season. Florida State offensively is a complete team. The running game is reliable with Devonta Freeman, James Wilder Jr., and Karlos Williams splitting carries. Florida State’s receiving core is as good as any teams in the country and boasts the consistent Nick O’Leary at tight end. Obviously, Heisman Trophy winner Jameis Winston at quarterback makes Florida State the juggernaut that it is. Auburn’s success in this game will likely come down to the play of its linebackers and defensive backs. Auburn has overcome allowing a lot of yards this season by making plays when it needed them most. However, these units will need to play more consistently to keep FSU from piling up the points. Florida State’s success will hinge getting out to an early lead against Auburn. If they can do this, they can likely put Auburn into passing situations. 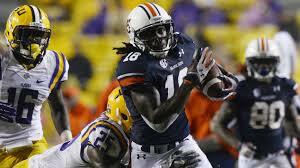 Auburn’s passing game hasn’t had to be there for the Tigers due to their success running the ball. The pressure to score while throwing the ball may be enough to throw the Tigers out of rhythm. Nick Marshall is the most important player for the Tigers. He will be trusted to make the right reads and make plays when FSU commits to stopping Tre Mason. Marshall’s ability to gash the FSU defense and protect the football will be keys for the Tigers. Winston is the Heisman winner, so everyone will be watching his performance regardless. Aguayo won the Lou Groza Award this season and given Auburn’s knack for making timely plays, he may be called upon to make several field goals. If FSU can’t convert drives into touchdowns, it must fare better than Alabama did in terms of getting points when the opportunity presents itself. Ultimately, Florida State is the more complete team. Auburn has been great in spurts this year; however, they simply are not as good as Florida State across the board. Auburn will have success running the ball like the do every week, excel in the special teams, and push Florida State with their offensive pace. 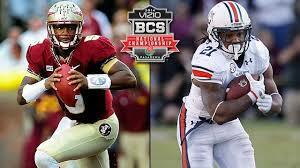 Florida State will capitalize against an Auburn defense that will struggle to match up with FSU on the perimeter. The FSU passing game should flourish and as a result, I think Florida State will find it’s offensive rhythm early in the game.